I can’t tell you how many times I have turned or twisted my ankles. Every time it happened, I would not get it checked out, I just let time heal the sprain and eventually I would start walking naturally again. I know now, my ankles did not heal properly. It wasn’t till a few years had went by that I started noticing I could not flex or rotate my ankle without experiencing pain or stiffness. On a daily base, If I did much walking, my ankles would get weak and ache with chronic pain, even into the night. I knew this was an old injury and as years went by, it seemed to get worse not better. In fact, I worried about further injury because of the weakness and the unstable feeling I had, when walking. Through some research and reading, I found something that actually worked and I’m PAIN FREE. I would have never believed it, if someone had told me. And the beauty of it is, it cost me only $8.88. I bought the (Figure 8 Ankle Support) from a website called rescuelegs.com. I thought why not try it for $8.88. The first time I put it on, I felt the encircled support around my ankle, heel and foot area. I’m guessing that’s why it’s called the “figure 8” design. I liked the fact it was a stretchy knit, yet I felt the compressed effect. I have been wearing it for 4 months now and yes I’m Pain Free. I was informed and educated that the support and compression it provides, promotes good blood flow. By wearing the ankle support, it provides support and a light compression to my ankles, for better blood flow and oxygen to get to the bone and surrounding ligaments for the healing process. That’s why within time wearing the ankle support it starts healing and mending the old sprain and restores stability back to my weak bones. No one likes to hear the word “surgery” or wants to continually take pain meds and worry about the side effects they can cause. 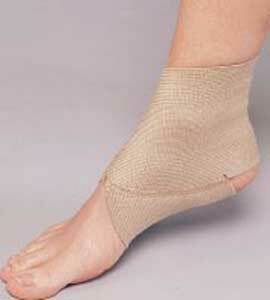 The Figure 8 Ankle Support Sleeve is a natural product, inexpensive, without any side effects. Hey It’s worth a TRY for $8.88. However, I’m not saying this will work for everyone, because you may have a more severe or totally different scenario going on with your ankles. So to be safe, you should contact your local physician and get a thorough examination for an accurate diagnosis, so your doctor can provide the treatment best suitable to your needs. If your wanting to try the – Figure 8 Ankle Support – call or go online and to www.rescuelegs.com and they will provide the proper size for your ankle measurement. At rescuelegs.com, the health of your legs and feet, is our priority. We hope you will call us, so our friendly certified fitters can offer expertise to help you find the proper support stockings, socks and ankle support to help relieve any vascular leg discomfort you may have in your legs and feet.